Successful contractors know their own strengths and know when to bring in another pro to help get the best results. But finding the right people who meet your high standards for quality and professionalism can be a challenge. One source that is too frequently overlooked is an industry association, especially for trades that don’t require professional certification. For example, suppose you need to hire a tile installer but you’ve been disappointed by inconsistent results in the past. The Terrazzo Tile and Marble Association of Canada (TTMAC) is a reliable source of professional installers and is widely acknowledged as the voice of the hard-surface industry. The association vets its members for quality of workmanship and financial stability. We also require that members follow the installation guidelines: Specification Guide 09 30 00 Tile Installation Manual 2012 – 2014. When interviewing a potential subcontractor, ask if they have attended any industry or manufacturer training, education and skills development programs. Find out if they know the ins and outs of the industry Specification Guide 09 30 00 handbook and whether they are familiar with the latest installation methods. web page just for that purpose: www.ttmac.com/jobs (or click on image). Hiring subcontractors can be risky business. Industry associations that set standards for membership can help you mitigate some of those risks. And, if you are dissatisfied with the installer’s work, you can go to the association and request an inspection report. If the installer’s work is deficient, his membership could be in jeopardy. This gives him one more reason to perform on your jobsite. Associations usually have a comprehensive membership directory. For example, go to www.ttmac.com and click on Membership Directory to find accredited members of the TTMAC. TTMAC has a long-standing history as the voice of the hard-surface industry and has been working diligently to raise the profile of the industry since 1944. In our continued efforts to improve and enhance service to our valued members, please be informed that we have added two additional services to our www.ttmac.com website. Are you looking for tradesmen, estimators, salespeople? Our members now have the availability, with no costs (FREE), to post job opportunities on our website. On a monthly basis, we are currently receiving an average of 2,500 visits and getting 10,000 pages views. The majority of these visits are industry related. This would then be an excellent vehicle to perhaps target the correct fit for job postings in your company. 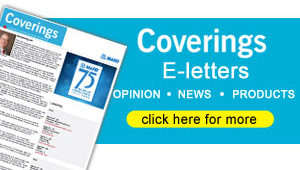 If you wish to use this service, please forward your postings to association@ttmac.com. Upon receipt, we will set up the links and post your job opportunities. 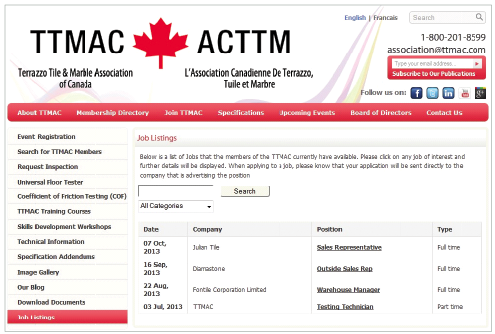 “Below is a list of jobs that the members of the TTMAC currently have available. Please click on any job of interest and further details will be displayed. When applying to a job, please know that your application will be sent directly to the company that is advertising the position.“ See more at www.ttmac.com/jobs.